Where is the Expo and Where do the Races Start? In Monmouth Park at: 175 Oceanport Ave., Oceanport, NJ 07757. Please look over the information on our website at http://www.njmarathon.org for more help during your planning. At The Novo Nordisk Health and Fitness Expo: Don’t forget to come early and stay late. We have a slate of free speakers and interactive classes for you to enjoy on Friday and Saturday (see Race Director Update # 9 for a list of topics and classes), as well as the Kentucky Derby and affiliated races going on in the Monmouth Park Club House Area next door. A few betting windows will be open on the expo floor as well! The cost of parking at Monmouth Park: The parking at Monmouth Park will be $5 per car this year. There was a mistake in one of my earlier updates, which was corrected in a recent one. I wanted to make sure that the correct fee was well known prior to race day. The fee will be collected upon leaving the park property. Start Line Stress Reduction: Race day morning can be a stressful time with nerves on edge and likely with not much sleep that night. That’s why we suggest that you make it as easy on yourself as possible by planning ahead and either taking the train or parking extra early or by carpooling whenever possible. Don’t get caught in traffic, and then wait in line to: get through the security checkpoints, check you race day gear bag for transport to the finish area and use the porta-johns and restrooms. Why not arrive early and take as much hassle out of the morning as possible? It is better to have extra time in the Park then it is to sit in traffic or stand in long lines. Please note: race day train tickets may still be purchased on-line but are only available for pick up at the Expo. 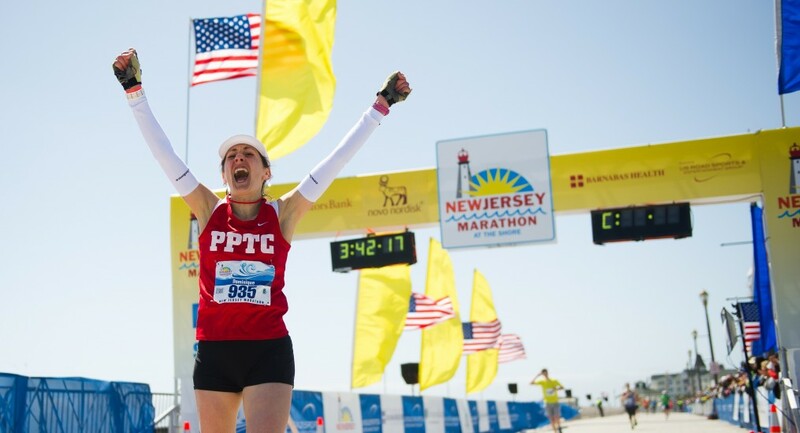 Athlete Tracking: The New Jersey Marathon IS planning to offer athlete tracking/runner tracking on race day. I had hoped to have the details finalized in order to give you a link to sign up in this message. I still don’t know if some portion of it will be paid by us and if we will offer you other options to connect with people through social media channels. It has been a very slow process and I have been consumed by the extra security details and planning. My intention in this communication is to make sure that you know that we will offer it in some form. Finish Area Parking at Seven President’s Park: There will be NO shuttle busing from Seven President’s Park to the start line on race day morning. This parking is designed to make travel as quick and easy as possible after your race and is especially useful for those half marathoners who desire a quick exit post-race. From Seven President’s Park, you can avoid the race-route completely when heading Northbound. South bounders can get to Rt. 18, Rt. 35 or the Garden State Parkway with a good map or a GPS by heading north (roads heading west and south will be closed as they intersect with the race courses). If you would simply like the convenience of having a car close to the Finish Line Festival there are many lots available. Parking at Seven President’s Park or in one of these other lots will also allow you to enjoy all that the Finish Line Festival has to offer and not be bound by the shuttle bus schedule (shuttles end prior to 4 pm). Please note: There is no need to pay $15 for Seven President’s parking or any of the other lots in the area around the Finish Line Festival if you plan to head back to the start line post-race. Parking at Monmouth Park is $5 and shuttles back to Monmouth Park lots from the finish area are free. All vehicles heading west to Monmouth Park will encounter the same blocked roads as our shuttle buses until about 10:15 am on race day morning! For questions please reach out to support@njmarathon.org. 1) Check out our free Shuttle Bus Schedule on our web site. Please note: the return shuttles will not begin their trips back to Monmouth Park until the roads between the finish area and Monmouth Park are open again after the racers have passed certain intersections. We estimate that those roads could be closed, or sporadically open, until about 10:15 am on race day morning. The departing shuttles from the finish area boarded in order by starting corrals. That way we can offer the shuttle service to those who have been waiting the longest time since they finished. Once we get that initial demand reduced we will board buses on a “whenever ready” basis. There is plenty to do while waiting for the courses to clear. Brian Kirk and the Jirks will be performing near the finish line, there will be raffles every 30 minutes (finish times and bibs will be chosen at random every 30 minutes), and there are many other bands and restaurants within walking distance. 2) Participants could be dropped off at the start line in Monmouth Park and have their support team drive to the finish area to park. After your race you will be able to easily dive north up Rt.36 through Sea Bright and even further without crossing the courses. Finish Times: Once you cross the finish line you’ll likely want to know your official finish time, and we’ve got you covered in an even better way this year. No more trying to find the results board, getting stuck in the crowd and then straining your eyes to find your name/bib # on the sheets. On race day the reader will take you to your individual results page on Active.com for your particular race. Please note, there are separate pages for each race (full, half and relay). Don’t worry, if you don’t have your smartphone with you as you can ask a friend to scan the QR Code on your bib for you. We will also have volunteers with smartphones at the Awards and Results tent to scan it for you if needed. Your friends and family will also be able to see your results online, within 10 minutes after you finish. And they can track your race progress prior to that (see below)! Reconnecting With Your Supporters: In the middle of the Finish Line Festival is an area that’s a good place to meet your family and friends after you’ve picked up your finisher’s medal, water and food, and your race day gear bag. Don’t forget to stop to pose for a picture with your new medal before leaving the finish line chute. There will also be official race photographers walking around in and near the Reunion Area for group pictures. Please do not try to have your supporters enter the finish line chute for pictures. Please note: You will not be allowed to re-enter the chute once you have exited and you will not be able to wait for slower runners inside the finish line chute. Race Day Weather: We will be watching the long range weather forecasts often during this last week prior to race day in order to make any necessary adjustment in our planning. With one week left, all I can tell you is that the weather varies from year to year (at noon on 4/28 it is currently 60º F and sunny at the Shore, with light winds). Help Us Help Others: Move for Hunger will be conducting a food drive during both days of the Novo Nordisk Health and Fitness Expo. Please remember, it’s “cans in hands” when heading to the expo. Please help us to make a positive impact on hunger right here in The Garden State!!! The MORE Foundation will be conducting a used athletic shoe drive during the Expo. Please remember to bring those shoes you no longer train and race in when heading to the Expo, and please tie the laces together. During our 2012 shoe drive you donated 900 pairs! This year another 900 would allow us to support two families for a year! This will be my last update prior to race day. Where did the time go? I hope that these ten weekly messages have made your planning for race day a bit less complicated, and that you know more about all the great things to do at our Expo, what to expect on the course during your race and at our Finish Line Festival. We all hope that you thoroughly enjoy your time with us. Please follow us on Facebook, Twitter and on our blog throughout the year to learn about the new things which we have planned for 2014, and to join us for our free: clinics, training runs, adventure runs, and the races which we sponsor, etc. throughout the year! We look forward to being a training/running resource for you year round and hope that you will stay in touch throughout the year as we are interested in you as athletes and not only as participants in our races. This one’s for you New Jersey, and Boston, and runners everywhere, as we welcome our friends and neighbors from across the state, the country and from around the world! This year we are celebrating the rebuilding and restoration of the environment, infrastructure and lives of the resilient, determined, residents of New Jersey as well as showing our compassion and support for the people most directly impacted by the tragedy in Boston. You inspire us each day with your dedication, determination and good humor, as you work through the many issues involved in endurance sports! Best wishes to each of you as you strive to be better than you were yesterday! Best wishes on race day and beyond! I was wondering – can spectators ride a bicycle up to viewing locations?